What Is Choka in Caribbean Cuisine? Choka isn't exactly a food—it's a way of preparing food, much like a stew is a way of preparing meat or poultry. A choka is primarily a dish made with vegetables or dry-cured fish, roasted or fire-roasted to impart a unique smoky flavor. Grilling won't produce the same authentic Latin American effect, but it will work if you have no way of cooking over open flames. You can use your broiler in a real pinch, too. Choka draws its origin from Indian cuisine—it's a popular dish in Bihar—so it's truly representative of the multicultural cuisine of the Caribbean, which is heavily influenced by Africa, India, China, the Middle East and Europe foods and traditions. The vegetable or fish base of a choka is pureed or finely ground after fire-roasting. It's then combined with aromatics such as onions, garlic, tamarind, hot pepper and cilantro. Seasonings can vary depending on the type of choka you're making. For example, cilantro is primarily used when making tomato choka, and it can also be added to potato choka. Six basic kinds of choka are enjoyed in the Caribbean and have been adopted elsewhere in the world. Potato choka: Called aloo choka in Trinidad, potato is the foundation vegetable in this dish. It's paired with green onions, cilantro and hot pepper sauce or flakes. The Trinidad version sometimes adds garlic. Coconut choka: Don't think sweet. Although this choka is made with coconut, it also includes onion, hot pepper sauce and thyme. One coconut is usually sufficient to feed a family of four. Salt fish choka: This is often made with shark in the Caribbean, but you can salt any fish you prefer. Add garlic, carrots, onions and soybean oil. Smoked herring choka: The herring is broken into flakes and added to tomatoes, olive oil and hot pepper. 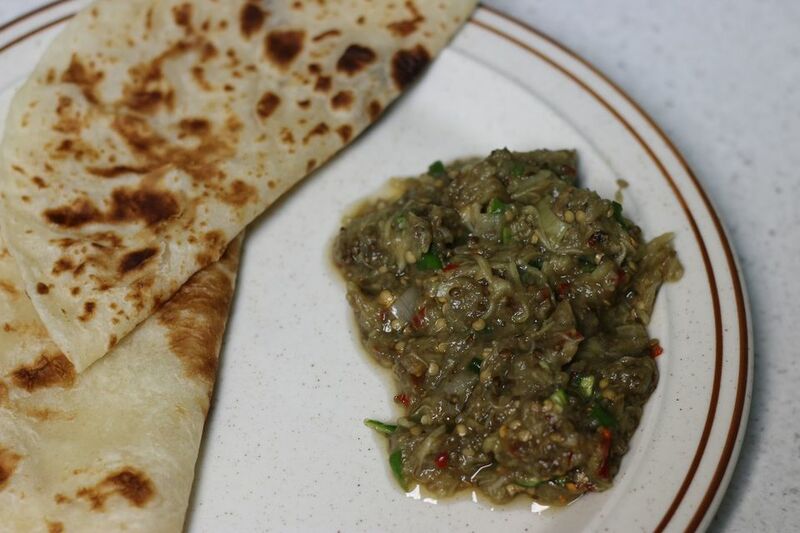 Eggplant choka: Called baigan choka in Trinidad and Tobago, the roasted eggplant is combined with tomatoes, onion and scotch bonnet pepper in this dish. Tomato choka: The addition of garlic, jalapenos, onion and corn oil round out this choka recipe based on tomatoes. Scotch bonnet peppers can be used in place of jalapenos if you prefer some serious heat, or you can serve the peppers on the side if any of your guests have delicate palates. Sweet onions are best for this type of choka. Other varieties include pumpkin choka and avocado choka. Chokas are generally enjoyed with roti, a type of Indian flatbread. If you're not in the islands and don't have time to make your own bread, consider Italian or French bread as an accompaniment. Chokas are eaten with rice and dhal, a spiced lentil soup, in some regions. Chokas can be served for breakfast, lunch or dinner, but a few are traditionally served at breakfast, including tomato choka, eggplant choka and potato choka.